For half a century, statisticians, pundits, and politicians have warned that a burgeoning population will soon overwhelm the earth's resources. But a growing number of experts are sounding a different alarm. Rather than continuing to increase exponentially, they argue, the global population is headed for a steep decline—and in many countries, that decline has already begun. 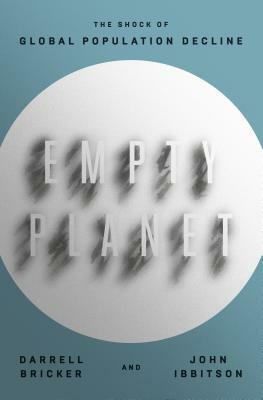 In Empty Planet, John Ibbitson and Darrell Bricker find that a smaller global population will bring with it many benefits: fewer workers will command higher wages; the environment will improve; the risk of famine will wane; and falling birthrates in the developing world will bring greater affluence and autonomy for women. But enormous disruption lies ahead, too. We can already see the effects in Europe and parts of Asia, as aging populations and worker shortages weaken the economy and impose crippling demands on healthcare and social security. The United States and Canada are well-positioned to successfully navigate these coming demographic shifts--that is, unless growing isolationism leads us to close ourselves off just as openness becomes more critical to our survival than ever. Rigorously researched and deeply compelling, Empty Planet offers a vision of a future that we can no longer prevent--but one that we can shape, if we choose. DARRELL BRICKER is chief executive officer of Ipsos Public Affairs, the world's leading social and opinion research firm. JOHN IBBITSON is writer at large for the Globe and Mail, Canada's national newspaper. Successful authors on their own, their first collaboration was on The Big Shift, a study of change in Canadian politics that became a #1 national bestseller.